If you liked this show, you should follow MsWildFlower. A weekly online radio show hosted by WildFlower that Bridges The Gap between metaphysics and how to implement them into every day life. To help you create your own reality, get deeper connected to your Inner Spirit and become the success you've always known you are. Expand. Evolve. Create Your Own Reality. Kevin Hogan, is the author of nineteen books. He is best known for his international best selling book, The Psychology of Persuasion: How to Persuade Others to Your Way of Thinking. He is the Body Language Expert and Unconscious Influence Expert to ABC, Fox, The BBC, The New York Times, The New York Post and dozens of popular magazines likeForbes,Investors Business Daily, InTouch, First for Women, Success!, and Cosmopolitan. 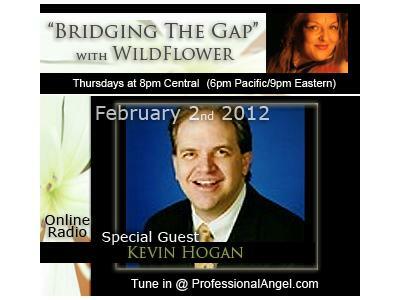 Kevin will be joining us to talk about self-sabotage, what it is and how to get beyond it to realize your goals. Sign up for the "WildFlower Institute" email newsletter at http://www.ProfessionalAngel.com to get updates about special guests and events.